the U.S. State of Montana. All Rights Reserved until it is officially adopted as the new flag of Montana. Why called the Big Sky Flag? Well, one of Montana's nicknames is "The Big Sky Country" and I want to create a state flag that captures that spirit that we Montanans have for our great state. My proposed flag will not represent any political party, ideology or group of people, it is to symbolize all of Montana and all it's people. The symbolism in the Big Sky Flag? Someplace read that the citizens of Montana were least likely to fly the Montana state flag and here is why; the current Montana flag was adopted in 1985 and according to NAVA's (North American Vexillogical Association) 2001 State/Provincial Flag Survey, the people (both the members of NAVA and the general public) ranked Montana's current flag among the 10 worst designs. 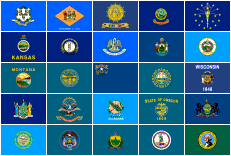 As a Montanan, I think it is time to change the state flag for these reasons because the..
1. is indistinguishable from 24 other state flags. (Can you find Montana's current flag right away and describe it in detail?) ^-------------click the "indistinguishable" link to find it. 2. is so simple that a child can draw it from memory. 6. can be reproduced on a small scale. 9. will create unity and cohesion for Montana. 10. is rooted in our tradition but open to the future. 11. will cost nothing to replace the current flag. In 2014, Montana will hopefully be celebrating its 150th anniversary of becoming a territory in May 28, 1864 and the 125th anniversary of becoming a state in November 3, 1889. A new flag will be a great way to commemorate the occasion. This is what the Minnesota State Flag Oughtta Be! How will it legally read? Montana Code, Part 5 1-1-502. The dark blue: *[R:24 G:0 B:122] => represents the sky during the night. 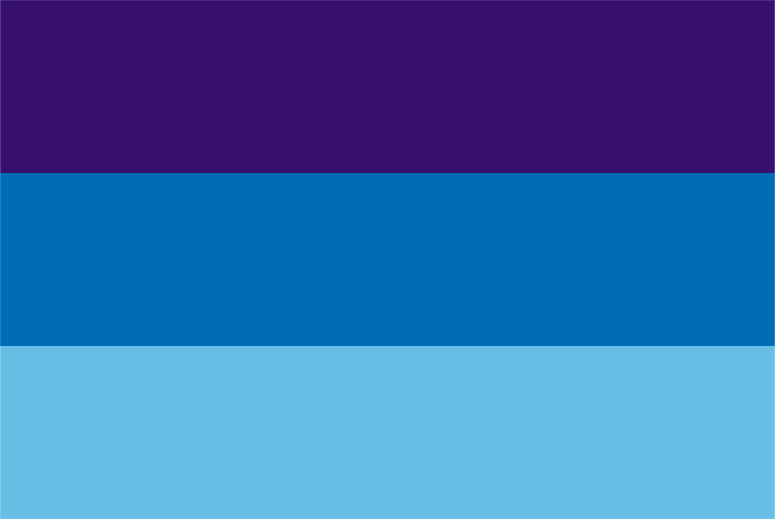 The medium blue: *[R:19 G:109 B:187] => represents the sky’s transition. The light blue: *[R:145 G:217 B:255] => represents the sky during the day. Who designed The Big Sky Flag? It was designed by me, Michael Riedel, who was born in and still lives in Billings, Montana. I'm an artist, member of NAVA and an amateur photographer. This design is copyrighted my me until it is officially adopted as the flag for the state of Montana by the Montana Legislator. Where can we discuss this?